On May 20th, we will hold our first sewing workshop at Joann Fabrics in Southcenter. The workshop is from 2 to 6 PM. 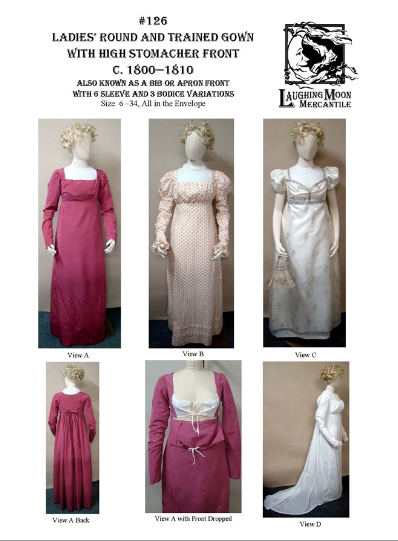 Several of our members will be present to assist you in getting started with that all important Regency Gown. One of our favorite patterns is the Laughing Moon Ladies’ Round and Trained Gown c. 1800-1810. This pattern has the bib or apron front and has many variations in sleeves and trains. We have had good luck with this pattern and have found it very versatile and flattering to many body types. During the class we will show various examples of this gown along with advice on how it is made and options you might want to consider. 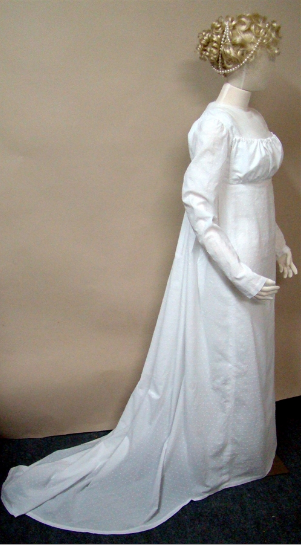 We will also give you information on where to find appropriate Regency like fabrics and other supplies. The class will be an overview of the pattern with descriptions and examples for you to see and touch. We can measure you so that you cut out the correct size; then we will trace your bodice on tracing paper and make a mock up bodice for fitting.